If you are using your computer for ordinary day-to-day activities such as games, web browsing, email or Office apps, you do not need to activate Developer Mode and in fact, you shouldn't activate it. The rest of the information on this page won't matter to you, and you can safely get back to whatever it is you were doing. Thanks for stopping by! When you see this dialog, click settings for developers to open the For developers settings page. You can go to the For developers page at any time to enable or disable Developer Mode: simply enter "for developers" into the Cortana search box in the taskbar. From the For developers settings dialog, choose the level of access that you need. Read the disclaimer for the setting you chose, then click Yes to accept the change. Enabling Developer mode requires administrator access. If your device is owned by an organization, this option might be disabled. Which setting should I choose: sideload apps or Developer Mode? You can enable a device for development, or just for sideloading. Microsoft Store apps is the default setting. If you aren't developing apps, or using special internal apps issued by your company, keep this setting active. Sideloading is installing and then running or testing an app that has not been certified by the Microsoft Store. For example, an app that is internal to your company only. Developer mode lets you sideload apps, and also run apps from Visual Studio in debug mode. By default, you can only install Universal Windows Platform (UWP) apps from the Microsoft Store. Changing these settings to use developer features can change the level of security of your device. You should not install apps from unverified sources. The Sideload apps setting is typically used by companies or schools that need to install custom apps on managed devices without going through the Microsoft Store, or anyone else who needs to run apps from non-Microsoft sources. In this case, it's common for the organization to enforce a policy that disables the UWP apps setting, as shown previously in the image of the settings page. The organization also provides the required certificate and install location to sideload apps. For more info, see the TechNet articles Sideload apps in Windows 10 and Get started with app deployment in Microsoft Intune. On the desktop device family: You can install an app package (.appx) and any certificate that is needed to run the app by running the Windows PowerShell script that is created with the package ("Add-AppDevPackage.ps1"). For more info, see Packaging UWP apps. On the mobile device family: If the required certificate is already installed, you can tap the file to install any .appx sent to you via email or on an SD card. Sideload apps is a more secure option than Developer Mode because you cannot install apps on the device without a trusted certificate. If you sideload apps, you should still only install apps from trusted sources. When you install a sideloaded app that has not been certified by the Microsoft Store, you are agreeing that you have obtained all rights necessary to sideload the app and that you are solely responsible for any harm that results from installing and running the app. See the Windows > Microsoft Store section of this privacy statement. 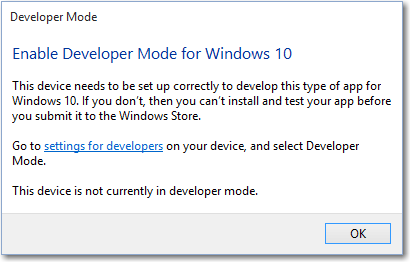 Developer Mode replaces the Windows 8.1 requirements for a developer license. In addition to sideloading, the Developer Mode setting enables debugging and additional deployment options. This includes starting an SSH service to allow this device to be deployed to. In order to stop this service, you have to disable Developer Mode. Windows Device Portal. Device Portal is enabled and firewall rules are configured for it only when the Enable Device Portal option is turned on. Installs, and configures firewall rules for SSH services that allow remote installation of apps. Enabling Device Discovery will turn on the SSH server. For each device family, additional developer features might be available. These features are available only when Developer Mode is enabled on the device, and might vary depending on your OS version. To learn more about Device Portal, see Windows Device Portal overview. 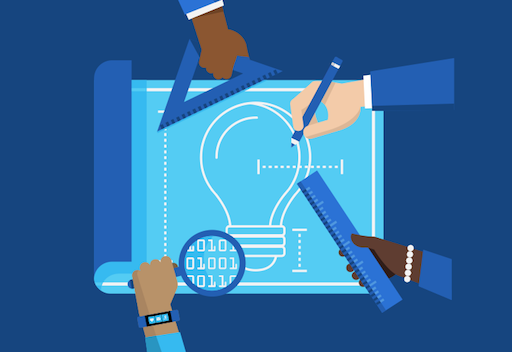 If you encounter problems enabling Developer Mode or Device Portal, see the Known Issues forum to find workarounds for these issues, or visit Failure to install the Developer Mode package for additional details and which WSUS KBs to allow in order to unblock the Developer Mode package. SSH services are enabled when you enable Device Discovery on your device. This is used when your device is a remote deployment target for UWP applications. The names of the services are 'SSH Server Broker' and 'SSH Server Proxy'. This is not Microsoft's OpenSSH implementation, which you can find on GitHub. In order to take advantage of the SSH services, you can enable device discovery to allow pin pairing. If you intend to run another SSH service, you can set this up on a different port or turn off the Developer Mode SSH services. To turn off the SSH services, turn off Device Discovery. SSH login is done via the "DevToolsUser" account, which accepts a password for authentication. This password is the PIN displayed on the device after pressing the device discovery "Pair" button, and is only valid while the PIN is displayed. An SFTP subsystem is also enabled, for manual management of the DevelopmentFiles folder where loose file deployments are installed from Visual Studio. The existing SSH server used in Windows is not yet protocol compliant, so using an SFTP or SSH client may require special configuration. In particular, the SFTP subsystem runs at version 3 or less, so any connecting client should be configured to expect an old server. The SSH server on older devices uses ssh-dss for public key authentication, which OpenSSH has deprecated. To connect to such devices the SSH client must be manually configured to accept ssh-dss. When you enable device discovery, you are allowing your device to be visible to other devices on the network through mDNS. This feature also allows you to get the SSH PIN for pairing to this device by pressing the "Pair" button exposed once device discovery is enabled. This PIN prompt must be displayed on the screen in order to complete your first Visual Studio deployment targeting the device. You should enable device discovery only if you intend to make the device a deployment target. For example, if you use Device Portal to deploy an app to a phone for testing, you need to enable device discovery on the phone, but not on your development PC. On the desktop device family, the For developers settings page has shortcuts to settings that you can use to optimize your PC for development tasks. For each setting, you can select the checkbox and click Apply, or click the Show settings link to open the settings page for that option. 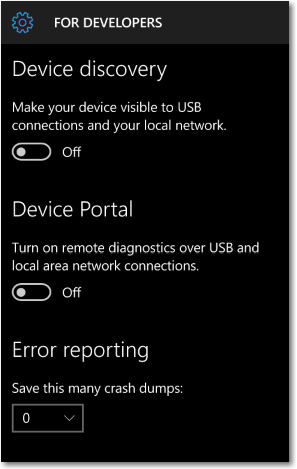 In early versions of Windows 10 Mobile, a Crash Dumps option was present in the Developer Settings menu. This has been moved to Device Portal so that it can be used remotely rather than just over USB. There are several tools you can use to deploy an app from a Windows 10 PC to a Windows 10 device. Both devices must be connected to the same subnet of the network by a wired or wireless connection, or they must be connected by USB. Both of the ways listed install only the app package (.appx/.appxbundle); they do not install certificates. Use the Windows 10 Application Deployment (WinAppDeployCmd) tool. Learn more about the WinAppDeployCmd tool. 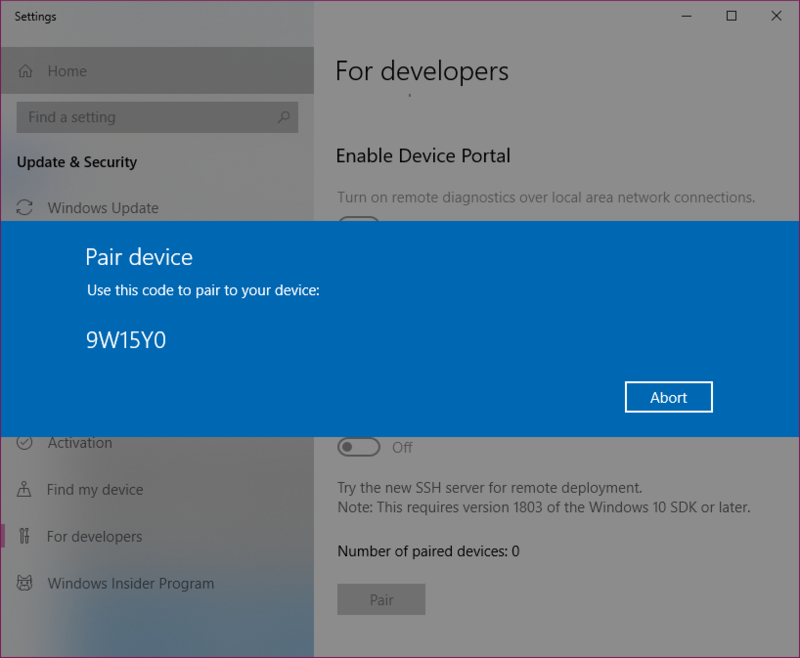 You can use Device Portal to deploy from your browser to a mobile device running Windows 10, Version 1511 or later. Use the Apps page in Device Portal to upload an app package (.appx) and install it on the device. Sometimes, due to network or administrative issues, Developer Mode won't install correctly. 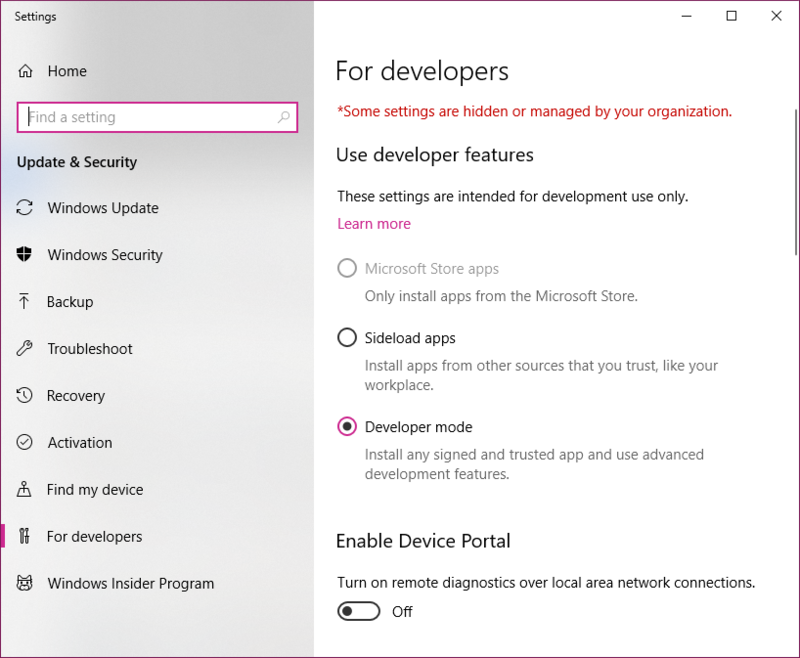 The Developer Mode package is required for remote deployment to this PC -- using Device Portal from a browser or Device Discovery to enable SSH -- but not for local development. Even if you encounter these issues, you can still deploy your app locally using Visual Studio, or from this device to another device. See the Known Issues forum to find workarounds to these issues and more. If Developer Mode doesn't install correctly, we encourage you to file a feedback request. In the Feedback Hub app, select Add new feedback, and choose the Developer Platform category and the Developer Mode subcategory. Submitting feedback will help Microsoft resolve the issue you encountered. "Developer Mode package couldn’t be located in Windows Update. Error Code 0x80004005 Learn more"
This error may occur due to a network connectivity problem, Enterprise settings, or the package may be missing. Check for Windows updates in the Settings > Updates and Security > Windows Updates. Verify that the Windows Developer Mode package is present in Settings > System > Apps & Features > Manage optional features > Add a feature. If it is missing, Windows cannot find the correct package for your computer. After doing any of the above steps, disable and then re-enable Developer Mode to verify the fix. "Developer Mode package failed to install. Error code 0x80004005 Learn more"
This error may occur due to incompatibilities between your build of Windows and the Developer Mode package. Reboot your computer to ensure all updates are applied. For most developers, you want to use the settings app to enable your device for debugging. In certain scenarios, such as automated tests, you can use other ways to enable your Windows 10 desktop device for development. Note that these steps will not enable the SSH server or allow the device to be targeted for remote deployment and debugging. You can use gpedit.msc to set the group policies to enable your device, unless you have Windows 10 Home. If you do have Windows 10 Home, you need to use regedit or PowerShell commands to set the registry keys directly to enable your device. Run PowerShell with administrator privileges. PS C:\WINDOWS\system32> reg add "HKEY_LOCAL_MACHINE\SOFTWARE\Microsoft\Windows\CurrentVersion\AppModelUnlock" /t REG_DWORD /f /v "AllowAllTrustedApps" /d "1"
PS C:\WINDOWS\system32> reg add "HKEY_LOCAL_MACHINE\SOFTWARE\Microsoft\Windows\CurrentVersion\AppModelUnlock" /t REG_DWORD /f /v "AllowDevelopmentWithoutDevLicense" /d "1"
When you create or sideload apps on your Windows 8.1 device, you have to install a developer license. If you upgrade your device from Windows 8.1 to Windows 10, this information remains. Run the following command to remove this information from your upgraded Windows 10 device. This step is not required if you upgrade directly from Windows 8.1 to Windows 10, Version 1511 or later. Error : DEP0700 : Registration of the app failed.